People with chronic disease should think twice before relying on the internet for health advice, research suggests. A University College London study found many would be in a better condition if they had simply listened to their doctor's advice. The study found interactive computer tools do improve medical knowledge. But there was no evidence they change behaviour positively, and some that they left people in worse health. The UCL team reviewed the effect of interactive web tools - known technically as Interactive Health Communication Applications (IHCAs) - on people with long-term conditions such as diabetes and asthma. In total they looked at 28 studies covering 4,042 participants. Lead researcher Dr Elizabeth Murray said she was surprised that the tools seemed to boost medical knowledge, but, if anything, have a negative effect on the users' health. Dr Murray said one reason for this apparent paradox may be that titbits of information may lull users into a false sense of security. Thus they become less motivated to control their condition in the way they would be if faced with a blunt instruction from a doctor. Alternatively, users may become so steeped in information that they make treatment choices on their own, contradicting advice from their doctors. For instance, a diabetic person might be told by a doctor to lower blood sugar but decide, based on his own interpretation of data, that the short-term tradeoffs of not complying are worth the long-term risks. Dr Murray said: "We found that people who use these things had more sugar in their blood than those who didn't." The researchers say more work is needed to fully understand the negative effect of interactive health applications on clinical outcomes - and whether some computer health programs can be designed to improve them. The UCL team defined an IHCA as a computer-based information source combined with one or more additional services, such an on-line support group, chat room or tailored advice based on data provided by the user. 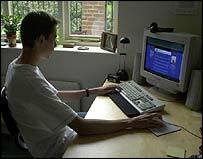 Dr Murray said, however, that some researchers "worry that the friends you make on computer are not right sort of friends, won't be there for you and may not be good for your social well being." The authors suggest that other assumptions about interactive health care are flawed. For example, if knowledge was all that was needed to promote healthy behaviour, smoking would not be as prevalent as it is. Further, well-informed health consumers may not, as expected, drive down the use of health care but may increase it by demanding specific and possibly more costly treatments. The review appears in the Cochrane Collaboration, an international organization that evaluates medical research.